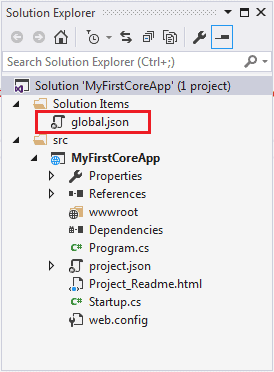 The global.json file is created by default in the ASP.NET Core 1.0 application under Solution Items folder in Visual Studio. The following is the default global.json in ASP.NET Core 1.0 application. The projects setting is used to specify different folders which are part of your ASP.NET Core application. These folders may contain another project to support your application such as unit test project, the business layer or data layer projects of your application. The .NET Core CLR use this information to find the source code to compile. version setting specifies the version of DNX used e.g. "1.0.0-preview2-003131" or "1.0.0-rc1-update1". runtime settings can be used to specify the CLR to be used to run the project. The possible values are clr for ASP.NET 4.6 runtime or coreclr for ASP.NET Core 1.0 runtime. If we don't specify this, the app will be compiled for both runtimes. architecture settings can be used to specify computer architecture x86 or x64.